China Glaze is a brand as of late that is very hit or miss. I either love a collection or absolutely hate it. I'd say their summer Lite Brites collection was a definite hit. I had a handful of polishes from this collection I picked up, but I was most intrigued by their microglitter jelly polishes. I have one of those to share with you today. 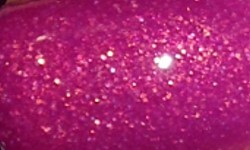 We Got The Beet is a grape purple jelly filled with golden/copper microglitters. Color: I adore this color. It's the perfect summer purple that is bold and bright. I love the golden microglitter in this best. You know me I love my cool-toned colors paired with warm metallics. It's an amazing color combination that is very summery. Formula: Here is what surprised me. I've heard a lot of people complain about the formula on this one. I personally did not have any issues with it whatsoever. I felt it applied nicely. This does dry down matte and textured, so I definitely think top coat is a must. I'm not sure if there were batch issues with this, I just had better luck with it, or I was expecting it to be bad and it wasn't that bad! I used 2 coats above. Price: I got this on eBay I think for around $4. I'd search for this one e-tailers. It's always more expensive at Ulta or Sally's. Overall: I love this fun summer color. I love the jelly look plus the glitter. Yes, it's a definite throwback to jelly shoes. I hate those so much. I loved the look, but they always gave me blisters. Anyways! This polish rocks in my book.